Anthony Hayes, a partner at Nelson Mullins Riley and Scarborough, L.L.P., in Columbia, S.C., started the Wills for Heroes (WFH) program shortly after the Sept. 11, 2001, terrorist attacks. Since November 2001, the charitable 501(c) (3) program has provided more than 15,000 estate planning documents nationwide. Attorneys Anthony Hayes and Jeffrey Jacobson oversee the Wills for Heroes Foundation. 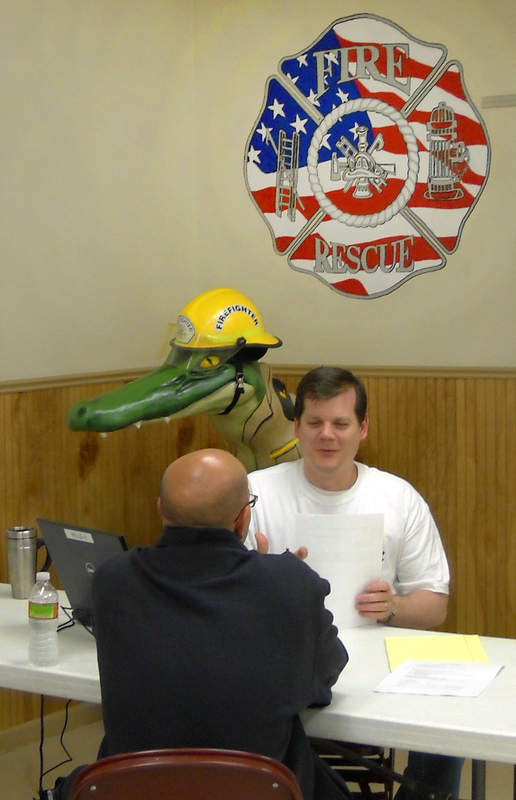 In October 2008, the Young Lawyers Division (YLD) of the Louisiana State Bar Association (LSBA) hosted Louisiana’s first Wills for Heroes event in Lake Charles for the Calcasieu Parish Fire Department. Since that time, the YLD has continued to host events for Louisiana first responders, including firemen, police officers, sheriffs’ deputies and state troopers. To support emergency personnel in our community who are prepared to pay the ultimate price in the line of duty, the Wills for Heroes program provides first responders with the peace of mind of knowing their affairs are in order should the unthinkable occur. This program is designed to provide free legal services to first responders in preparation of basic estate planning documents. First responders include police officers, firefighters, paramedics, EMTs, corrections officers, and the spouses or widow/widowers of such personnel. To serve first responders, a group of attorney volunteers will go to emergency service sites across Louisiana and set up a clinic, at which time the attorney volunteers will draft basic wills, powers of attorney and health care directives for eligible first responders and their spouses. In advance of the meeting, first responders will download documents from this site to be completed prior to their clinic appointment. Reviewing and completing these documents before the clinic is a successful component because it affords the first responder the opportunity and time to think through very important decisions and discuss them with trusted advisors and family and gets them fully prepared before their scheduled appointment. With laptops and portable printers, a group of attorney volunteers will arrive at the location (police station, fire station, etc.) and work with each first responder to discuss his/her matter in a confidential manner. The participants and attorneys will review their completed questionnaire. Simultaneously, a paralegal, law student or other support staff member will sit next to the attorney and enter the information into the laptop. Once the questionnaire has been reviewed and the process explained, the will, power of attorney and health care directive will be generated. The attorneys will review the entire document with the participants to ensure they fully understand what they are executing. After the document is explained, and any corrections made, the will, power of attorney and health care directive will be executed and notarized. The goal is to complete the entire process in one meeting. What is the Wills for Heroes Foundation? The Wills for Heroes Foundation works nationwide with affiliate organizations to provide free wills and other estate planning documents to America’s first responders, which include police officers, firefighters and paramedics. No, this will not cost you any money. The program is funded by the Louisiana State Bar Association and is completely free to all first responders. We only ask that you show up on time and have your paperwork filled out. All of the volunteers are devoting their weekend to write your wills and we want to make sure that their time is used efficiently. As a public officer, can I accept this gift? Yes, the Louisiana Legislature has specifically amended the law to allow first responders to participate in the Wills for Heroes program. Yes, you are able to change your will at any point in the future if you so choose. If circumstances arise and you need to redo your will, you need to contact an individual attorney to help you. Your attorney volunteer is neither required nor allowed to assist you with changing your will outside of a WFH event. Is the will valid in Louisiana? Yes, the wills are valid in Louisiana. They were specifically written for Louisiana citizens with Louisiana law being considered. All information presented at the event will be kept confidential and is for the sole use of the WFH program. All draft documents are shredded after every event. Show up on time, have your paperwork filled out, give us all the information you can, and be courteous to our volunteers. We get this question from time to time. There is no “catch.” We are doing this to give back to those who risk their lives for our communities on a regular basis. The wills are valid, they are well written, and they are the same as what you should expect to get if you hired an attorney privately. The only thing that we ask in return is that you tell your friends about the program and encourage them to participate in the future. How do I get an event in our area? Although the YLD frequently contacts various first responder groups directly, we welcome any and all first responder groups to contact us about hosting an event. While we respect that the various first responder groups have a ranking system, any first responder is welcome to contact us about an event in his/her area. We will then contact whoever is necessary to plan an event. Please refer to the “Contact Info” section. After the YLD has established an event date with a first responder group, the YLD then contacts the local bar association in that area. The attorney volunteers are comprised of the attorneys in the first responder group’s city/community; however, at least one YLD Council member is present at every event in order to provide the equipment and manage the event. The goal of the Wills for Heroes program is to provide free wills for first responders (police officers, EMS and fire fighters). Several other states, through their young lawyers, have adopted the program with great success. The person(s) who chair this committee have the responsibility of implementing this program across Louisiana this year. For more information on the Public Service/Wills For Heroes Committee of the Louisiana State Bar Association's Young Lawyers Division, please click here.